Two-thousand years ago, a Jewish man fell in love with the mystical teachings of his faith – teachings about love, compassion, and oneness. In his love of his faith, he discovered an intimate relationship with the Divine who he called “Abwoon” – meaning all that is. He felt the love of this Divine being as the love of a parent for their child – and even more so. In this love, the man found peace, contentment and joy along with the means by which he could experience “heaven on earth.” In his excitement of this discovery, this Jewish man did what every rabbi did before him; he sought to teach others what he had learned. He taught where all rabbis taught – in the synagogue, in the courtyard of the Temple, in the fields, on the hillsides and near the shores of the living waters. He was invited to dinner in people’s homes and he taught there. He taught wherever there were those “with ears to hear.” In his wanderings, he attracted a company of women and men who chose to follow him so that they might learn even more from this man who knew and showed great love. In this company of women and men, there was a very special woman, Mary, from the house of Lazarus. She along with her brother Lazarus and sister Martha, became Jesus’ devoted students, learning all he could share with them, while gaining insights and revelations of their own. Mary took to Jesus’ teachings in a unique and special way. Soon, Mary and Jesus became one. Mary understood the depth of what Jesus had come to know in a way unique from the others and in this, she too became teacher. When Jesus was arrested, put on trial and murdered, Mary was there by his side. With the other women and a few brave men, they stood watch and offered prayers of support for Jesus as he suffered and died. They never left his side. When Jesus’ body was removed from the cross, Mary and the other women anointed his body for burial, wrapped it in linen cloths and offered the requisite prayers of burial. When the stone was rolled in front of the entrance to the burial cave, the women wailed. They cried. The tore their hair and clawed at the ground. In tending to their own grief and to the horrors of Jesus’ dying, they created space in which new life could begin. And it did. Three days later, Jesus rose from the dead and appeared to Mary. She saw and she believed. And then Jesus did a remarkable thing – he appointed Mary, now called Magdalene, “Tower of the flock.” Mary was ordained and sent forth to continue Jesus’ mission in his stead. He did not give over his mission to the men who remained hiding in the Upper Room. He gave it to the woman who had the willingness to be emptied of all within her that might hinder her from knowing anything other than LOVE. He gave it to the woman who was free enough of ego to stand face to face with her greatest fear – the torture, suffering and death of her beloved and to have the courage to trust that even in this greatest loss, new life would emerge. Mary was the new life. Mary, now called Magdalene, went forth to share with the other disciples the good news and to continue what Jesus began – supporting the disciples and anyone else with ears to hear – in the mission of Love. But then, patriarchy stepped in. Unwilling to let go of their fear of the patriarchal cultural norm and unwilling to set aside their egos enough to remember the equality that Jesus taught, the disciples rejected Mary’s message. “This is the ravings of a woman. Jesus’ could not have risen from the dead. What does that even mean?” Then Mary showed them. She showed them how they could see Jesus and experience his presence, his guidance and his teachings. They saw a glimpse, but they did not experience the fullness of what Mary described and then they became jealous. They asked Mary why Jesus would appear to her and not to them. How could he love her more than they? Mary tried to explain, and Jesus through her. But still the disciples could not accept that Jesus would choose her over them. So they cast her out. Mary then went on her own way, with Lazarus and Martha beside her, the other women, along with a couple of the men who believed, and did what Jesus ordained her to do. She continued in the mission of Love. The other disciples tell it differently. It is to Peter that Jesus gave the mission of building the new church (a church Jesus never spoke of building), and the purpose of this church was salvation. Only those who believed as the disciples told it would be welcome into paradise at the end of time – totally forgetting that the only kingdom Jesus spoke of what the one right here in our midst when we are free enough of our fears to know Love. Sadly the Love Jesus taught was forgotten and replaced instead by fear. This fear is the patriarchal wound of Christianity. Fear born out of jealousy. When the disciples cast out the woman Jesus ordained to continue in his stead, they cast out all women. No longer reflecting the balance between masculine and feminine that Jesus favored, the Church became the distortion of love. Instead of being rooted in the Oneness that Jesus preached, the new Church was based in separation and fear, power, control and privilege. Like the patriarchal culture in which they were raised, the men created a hierarchical, patriarchal institution where those in power are lauded as better than the rest and where salvation was the privilege of the few who would obey their commands. What we have today is a sad and broken institution whose fear comes out sideways in gluttony, lust for power, wrath, envy, greed, sloth, and the worst of these – pride. Here children are raped and the offender excused, women are denied their rightful place as teachers and guides, our humanness (including our sexuality) is demonized, and instead of people living in LOVE, they are cowering in fear. Embracing Mary Magdalene changes all that! In place of fear we find love. Instead of hierarchy we discover collaboration. Instead of power over, we have power with. Not because of Mary, now called Magdalene, but because of what she represents – the core of Jesus’ message which is LOVE. But this message of Love is not even about Jesus – it is about the truth of our Source, our original nature, ourselves, all of creation, and that which some might call God. Love is who we are. Love is all there is. When we remember as Jesus and Mary Magdalene remembered, then there will be peace and we will fulfill our mission as humans which is to discover heaven on earth. So mote it be! Amen! My Latest Book, ONLY LOVE, Available Now!!!!!! A collection of writings received by Lauri Ann Lumby on behalf of Mary Magdalene. The ultimate purpose of these teachings is to support the world as it moves out of the fear that has held it imprisoned to the Love that is its original nature. Thank you for being a vessel through which you, and then the world, shall know that even in the human experience, there is Only Love. Click on image above to Buy it on Amazon. In paperback and Kindle. We are in an exciting time in the evolution of human consciousness. If you have found yourself drawn to these words, it is because you agreed to incarnate on the earth plane at this time to help usher in the age of Love. You have agreed to this on behalf of the Divine intention of Love and for the sake of all of humanity. As you know, this has been no easy task. In order to support humanity in its next stage of evolution you have first had to do it for yourself. Now you are the Body of Christ. Whether or not this is your chosen language, you have worked toward clearing past programming rooted in fear so you can more fully embody the Love /Light that is your true Divine calling. Congratulations and thank you! The words you now hold in your hands are my gratitude gift to you. I thank my beloved Lauri Ann Lumby for being the vessel through which these teachings may now come forth. The world is now ready and able to receive the Divine encodings presented herein. Some of these teachings I’ve given to Lauri directly. Some are her personal reflections. Others I wrote directly through her hand. Some of what you receive here may seem unreal or even shocking. Worry not about that. Take in what speaks to you and allow the teachings that might confront or challenge to simply be. If they are meant for you they will find their roots at a time divinely ordained for you. The ultimate purpose of these teachings is to support the world as it moves out of the fear that has held it imprisoned into the Love that is its original nature. Thank you for being a vessel through which you, and then the world, shall know that even in the human experience, there is Only Love. The Order of the Magdalene provides priestess and priest training for all levels of membership. Training is available through Lauri Ann Lumby, OM, MATS, founder of the Order and is accomplished online through the Mystery School of the Goddess. This FREE preview course gives you a glimpse into the required steps of the Magdalene Priestess Training and what it means to be a Priestess of the Magdalene. Descriptions of each of the required courses in the training are offered, along with sample lessons from each course. This FREE preview course concludes with a list of the benefits enjoyed by those who have completed the Magdalene Priestess Training and the next steps to be taken for those who feel called to this path of devotion and service. We humbly come before you in search of your intercession. Your hands that we may serve. In the company of our Beloved. All courses are based upon the foundation of sound psycho-spiritual formation, rooted in a gnostic/experiential/mystical approach to scripture, freeing the participant to transcend religious dogma, thereby discovering the hidden wisdom that leads us all toward unity and oneness – the Oneness that Jesus came to know and which he attempted to teach his disciples. Mary Magdalene is recognized as the one who most fully understood and received his teachings. The Order of the Magdalene Priestess Training empowers participants to know themselves – discovering their own unique giftedness and how they are called to share these gifts for the sake of their own fulfillment and in service to the betterment of the world. To learn more, click on image above, or contact Lauri Ann Lumby, OM, MATS at (920) 230-1313 or lauri@authenticfreedomacademy.com. Lauri is the owner of Authentic Freedom Academy and founder of the Order of the Magdalene. She lives in Oshkosh, WI. You can learn more about Lauri, her writings, programs and services at www.authenticfreedomacademy.com. What is Magdalene Priestess Training? Mary, The Magdalene is the only one identified to have completed the full course of Jesus’ teachings (“healed of seven demons”) and was initiated as co-equal partner and Beloved with Christ. It was to The Magdalene whom Jesus first revealed his resurrected/Christed Self and it was The Magdalene he commissioned to share the good news with the other disciples and to continue his work in his stead. As “The Magdalene” and designated “Apostle to the Apostles,” Mary was “the great tower,” shining the light of truth in a world separated by fear. The Order of the Magdalene continues this work in The Magdalene’s name so as to awaken the world to the truth of Mary’s role in Jesus’ ministry and life, and the higher truth of Jesus’ mission of LOVE which Mary alone understood, thereby restoring 2000 years of defamation at the hands of a patriarchal, hierarchical Church, further undoing the harm done to women specifically and the feminine in general. In restoring the Holy Feminine to the Jesus story, we also create the space in which the Holy Masculine can reclaim its place in our world, thereby supporting the world in the returning to its original nature in unity, harmony, peace and love. Outer change begins with inner change. Inner change begins with self-knowledge. Self- Knowledge leads to self-actualization. Self-actualized individuals, are inherently non-violent, cooperative and collaborative, and are naturally motivated to use their unique gifts in service to the betterment of the world. Discovering your unique giftedness and how the development and use of these gifts will provide for you a life of meaning and purpose. Moving through the fears and unhealed wounds that might otherwise prevent you from using these gifts to their fullest. Enjoying fulfillment in the use and sharing of your gifts for yourself, and for the sake of the betterment of the world. Connecting with a like-minded community through which you will find validation and support for your own mission and purpose in this life. Finding ongoing education and inspiration for the continued use of your gifts. Magdalene Priestess Training integrates specific tools and practices of Western Psychology with those of Western Spirituality, resulting in a powerful process through which participants are supported in becoming self-actualized and are then empowered to share their unique giftedness in service to the betterment of the world. From Western Spirituality, The Magdalene Priestess Training has its roots in the original teachings of Jesus* which Mary, called Magdalene fully understood and which were then formalized into the meditation, contemplation and service practices of Western Monasticism, specifically those favored in Benedictine, Franciscan, and Ignatian spirituality. 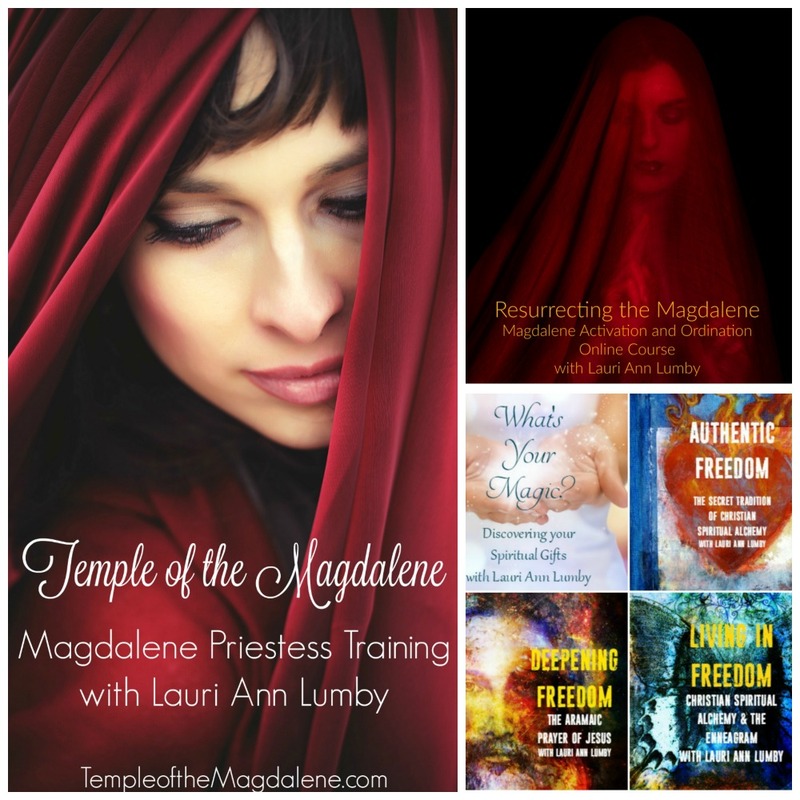 If you are interested in learning more about the Magdalene Priestess Training, please contact Lauri Ann Lumby, OM, MATS at lauri@authenticfreedomacademy.com or (920) 230-1313. The Order of the Magdalene, founded by Lauri Ann Lumby, OM, MATS, is a community of women and men who have been called to continue the work Jesus began of turning the world from separation and fear into oneness in love. The Order is named for Mary Magdalene – Jesus’ closest disciple, the only one identified to have completed the full course of Jesus’ teachings and initiated as co-equal partner and Beloved. It was to Mary whom Jesus first revealed his resurrected/Christed Self (it may, in fact, been through Mary’s intervention that Jesus was raised from the dead), and it was Mary he commissioned to share the good new with the other disciples and to continue his work in his stead. We do this work in her name in the hopes that doing so will awaken the world to the truth of Mary’s role in Jesus’ ministry and life, thereby restoring 2000 years of defamation at the hands of a patriarchal, hierarchical Church, further undoing the harm done to women specifically and the feminine in general. In restoring the Holy Feminine to the Jesus story, we also create the space in which the Holy Masculine can reclaim its place in our world, thereby supporting the world in the returning to its original nature in oneness, harmony, peace and love. Begin your journey today with the Order of the Magdalene by joining the online course Resurrecting the Magdalene. $30.00 off the regular price through May 31st! Redeem your discount HERE. There are four levels of membership in the Order of the Magdalene, dependent on members’ level of participation, training, and commitment. Associate Members are those who are simply participating in the courses and other offerings of Lauri Ann Lumby without making a commitment to the Order itself. This includes students in the Superhero, Authentic Freedom and other courses and workshops, both locally and online. Ordained Members are those who have completed either the local or online Magdalene Activation and Ordination Course (Resurrecting the Magdalene). Master Members are those who have completed the entire Authentic Freedom Mastery Curriculum including, Authentic Freedom, Deepening Freedom, Living in Freedom and What is Your Magic? Teachers are those who have completed the Authentic Freedom Facilitator’s training. Mentors are those who have completed all of the above, including the Authentic Freedom Facilitator’s Training, and have gone on to complete the Authentic Freedom Mentor training. High Priestesses and High Priests are those who have completed the Ordained and Master Member requirements and who have gone on to complete the secret and hidden teachings of the Magdalene, Reiki and/or Christouch training, and Shamanic initiation. Master Teachers have completed all of the above.